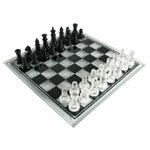 This is a magnificent Glass chess set intricately made from glass with white and gloss and black frosted chessmen. The chess board measures 8.5" x 8.5" x 1.75" with a 1 ¾” King. This chess set features a unique combination drinking game and chess in a presentation like no other. The set is made from glass and measures 11” x 11” with a 1 ½” King. The elegant beautiful contrasts of the pieces featured in these glass chess sets make for an entirely unique look and feel. Crafted of solid glass, these frosted and clear chess pieces display a dazzling array of reflections as they sit atop a glass board. The chessboard is 13-3/4 x 13-3/4" inches. The king is 3 in. This frosted glass chess set makes for a superb addition to any room. 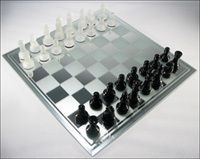 Glossy black and frosted white Staunton chess pieces sit atop a clear and frosted chess glass and mirrored board. This is a handsome set that will add a touch of class to any decor. The board measures 13.75 x 13.75 inches and The King is 3 inches tall. This elegant mirrored glass set features a solid hardwood construction and a handsome cherry finish. The chess board is made of contrasting frosted and reflective glass giving it a luxurious appearance. The glass top playing surface is secured by a brass latch which opens to reveal a storage area for the black and frosted glass chess pieces. The board measures 10 x 10 inches. The king measures 2.25 inches. A handsome chess set glass and wood based at a great buy. This beautiful chess set has a frosted glass chessboard with black & white Staunton classical pieces. The set includes a 15” x 15” black frosted chess board, a 3” king, and 32 chessmen. A complete set with a beautiful unique look at a very reasonable price! The legends of the dragons and their fascinating world comes alive with this magnificent pewter and glass chess set. Get a taste of their magical world with the amazing details found in this 3 dimensional game. The set includes a themed pewter base with 32 pewter chessmen and a beautiful glass chessboard. An one-of-a-kind selection from our line of glass chess sets and boards. This unbelievable exotic 3D chess set turns back the clock to the times when knights, members of warrior class of the middle ages in Europe, were prominent. This set features a pewter themed customized base which supports a glass chess board and incredibly detailed pewter knight pieces. Chess sets glass and metal combined into an entirely unique look at a great purchase price. CS066-2176. Modern Contemporary Designer Crystal Chess Set. Made from high quality European Crystal, these 1st Class Exclusive crystal chess sets feature pieces cut and shaped with the same techniques used to shape precious gemstones. The frosted mirror etched chess board adds in an exquisite contrast to its design. Click on the image above for additional details and photos of this stunning crystal chess set.